See I’m being pro-active and actually blogging properly again. And finishing up my summary of the 2012 finished objects is probably a good start. I finished the Wanderlust mittens back before Christmas and just haven’t got around to getting a picture of them until now. Cast on 66 stitches rather than 86 (only 3 cable repeats). 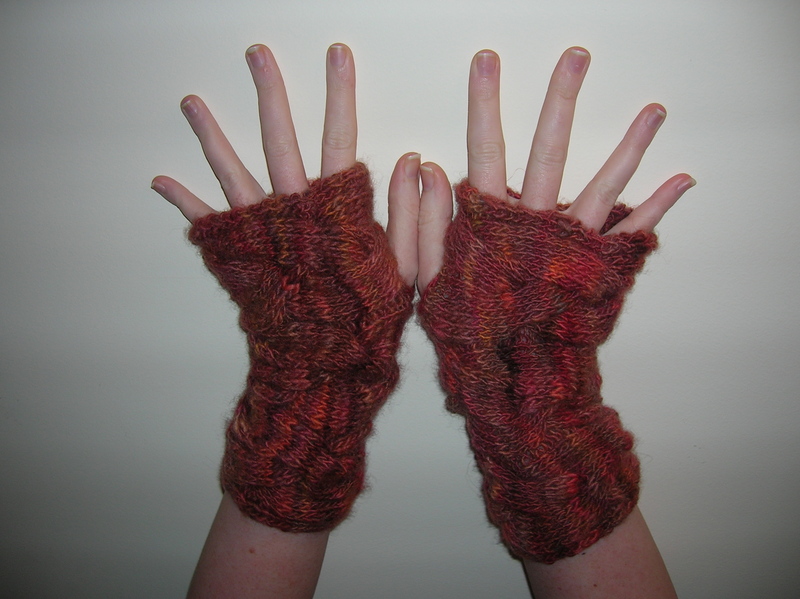 Used knitted cast on for thumb hole (turned work to RS to do this). Inserted last cable on row 13 of the repeat rather than 15 as was unsure of yardage left (there was enough in the end). Moved thumb hole to opposite end so that seam was placed over the palm rather than the back of the hand. Did not cast off but instead just grafted stitches to the cast on edge. (Could have used a provisional cast on but figured this was easier – it was). Tags: drop-spindle, handspun, knitty, mittens, shetland, spin | Permalink.